If you’re not a believer in the concept that “distance makes the heart grow fonder”, this love story will certainly change your mind. 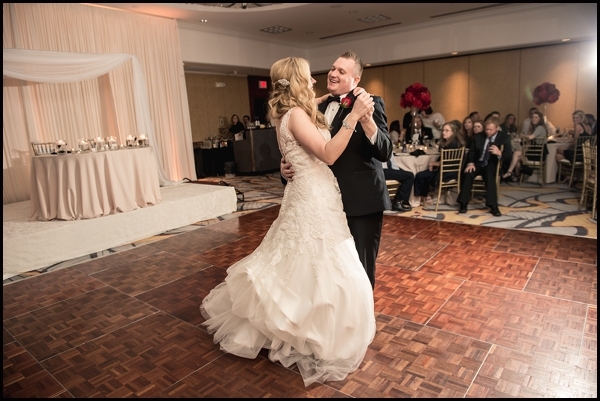 Brian and Sarah met through mutual friends, and had their very first date in early November, four years ago. They instantly felt a connection, that would soon face the ultimate test: distance. A few months after dating, Brian left Indiana for an opportunity in his home state of Illinois. Their relationship proved stronger than ever, after the two were finally reunited in Chicago after two years long distance love. Between traveling through the brutal midwest winters, and spending weeks on end apart, their relationship did nothing but strengthen. 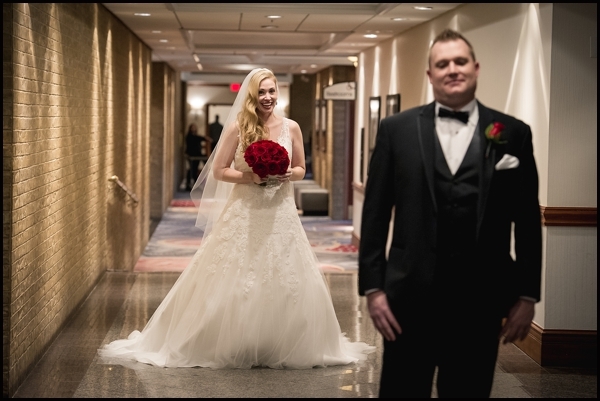 When Sarah decided to leave everything she knew and loved in Indiana, and venture out to Illinois- Brian knew she was the one. 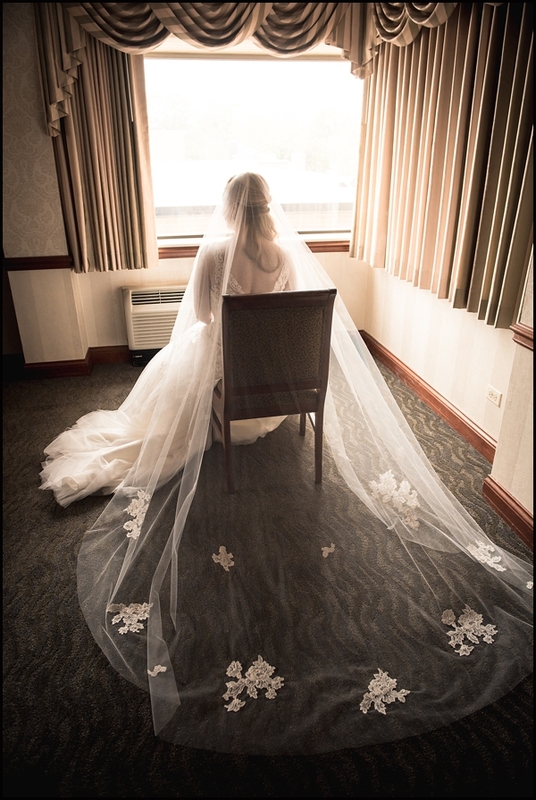 Sarah’s walked gown the aisle in a full lace and tulle A-Line gown by Rosa Clara accompanied with a matching crystal sash. 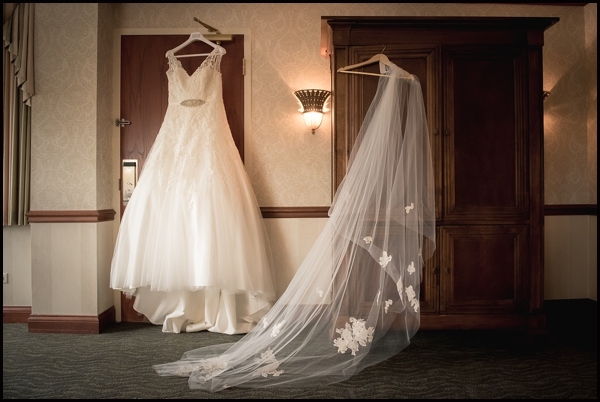 The “Matilde” style veil with lace appliques by Lea Ann Belter followed elegantly behind her. 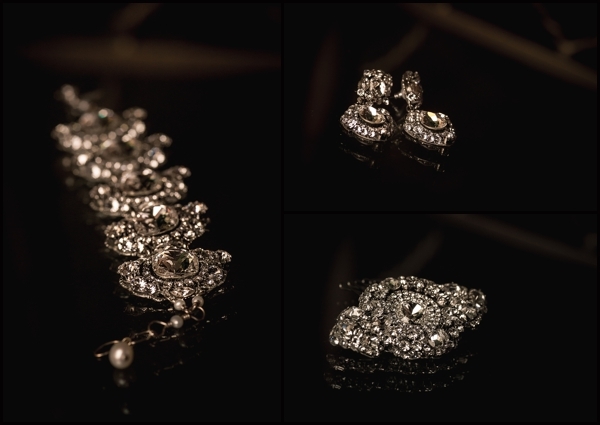 To complete her fabulous wedding day look, we accessorized Sarah with gorgeous pieces of Haute Bride jewelry. 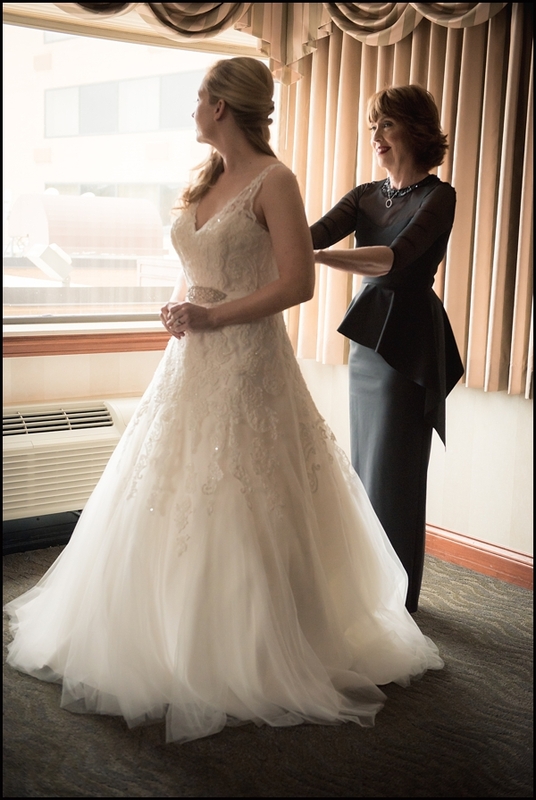 The cushion cut crystal brooch linked bracelet and the cushion cut decorated chandelier earrings added the perfect touch of sparkle on her big day. 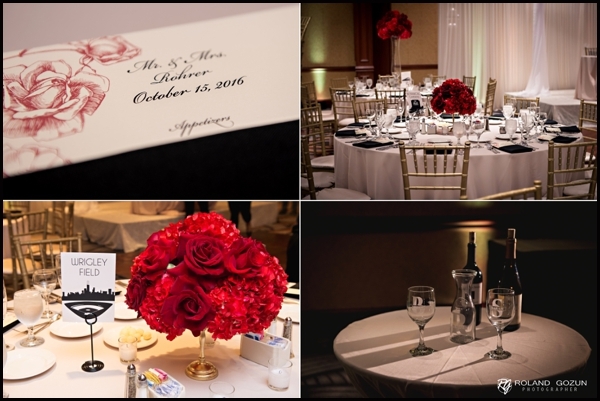 Sarah knew that for their wedding she wanted red roses, a classic and romantic feel, and to incorporate a little bit of home from Indiana. They decided to name 5 guest tables after Indiana landmarks, and 5 tables after Chicago landmarks to give a shout out to their home states. Sarah also wanted to include their rescue Pug, Emmett, into the mix. 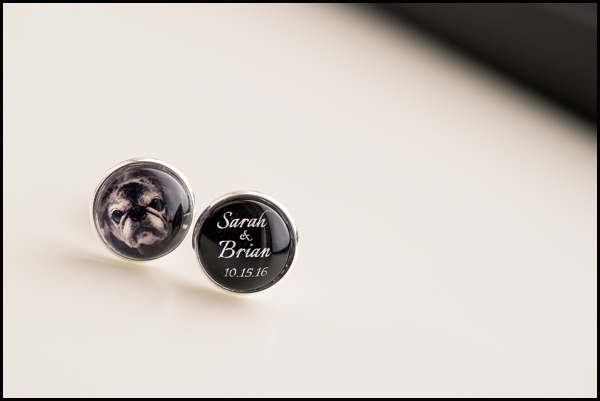 She had cufflinks personalized for Brian with Emmett’s face on them and bought a cake topper with a silhouette of a bride, groom, and their pug. Guests were also treated to a cartoon figure of Emmett on social media when they snap-chatted their pictures from the wedding. 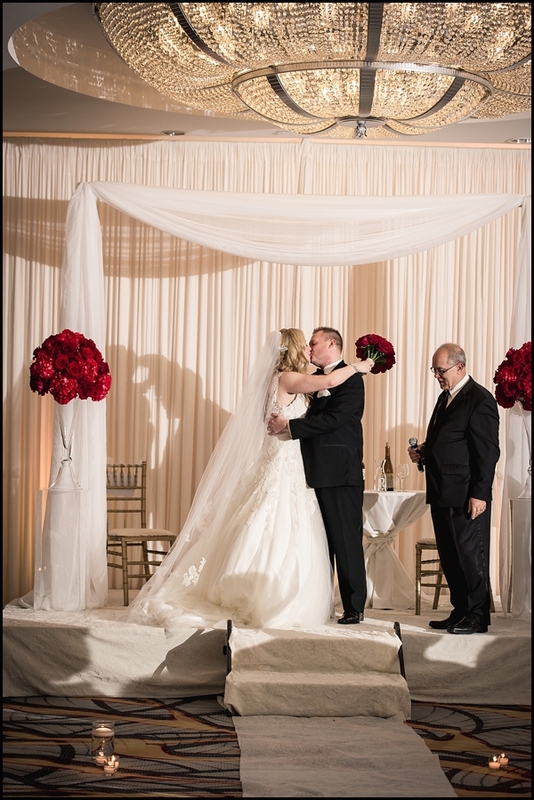 And just as it was back in the 1960’s….two love birds danced their first dance to Frank Sinatra singing “The Way You Look Tonight”.